MUDListings.com is a Web Site dedicated to being a single portal wherein MUD players and staff can list and promote their games, give reviews for theirs and other MUDs, view forums posts from a number of other MUD forums / discussions and more. Our aim is not to replace any other MUD site out there, but rather to offer services that either supplement other sites, offer redundancy (such as file hosting) for archival purposes in case other sites go down, and/or offer a single place where the services of other MUD sites can be accessed (forums, podcasts, hosting, etc.). We are always interested in feedback to improve our services or add additional ones where feasible. If you have feedback please feel free to post it on our forums, or send us an email. "game mechanics: stock diku with some dated modifications and VERY..."
"Let me start by saying… I’ve played ArmageddonMUD on and..."
"I played Armageddon for over a decade, then got deployed..."
I still like the game a lot, and think as far as RP mediums go, it's pretty much one of the best you can get across all genres. I left because of two things, mainly. One, the walking speed/timesink. They make it (I assume) so you walk very slow as to encourage you to get a vehicle, which I agree with. However, not nearly as slow as they make you. It got to the point that getting to another place, especially if it was in a different sector, would take 10 minutes minimum, or more depending on how lucky you got with the levs. I was heavily discouraged from playing because RP games are already a massive timesink, and with this, it meant that I constantly had to spend a ton of time walking from place to place (my character moved between sectors a LOT) and it honestly made me not want to RP sometimes. 'I need to go all the way up to you place, then spend 2-3 hours RPing, maybe, then come back... It's a huge time sink. To add to that, the XP system that makes it so you need to play daily to get the most of it pressures me to play, and I hate that. You should never be pressured to play anything, and I felt as if I wanted my character to progress quicker, I needed to play everyday. And the other thing was rent. I loved rent conceptually, but it was another layer of pressure. Making sure you had enough money, making sure you remembered when rent was due, and remembering to pay it in time or risk your character getting thrown out and possibly robbed (or worse). I know donators get free housing, but still. I understand why it's in place, same as the other mechanics, but it just wasn't fun. I didn't like thinking 'oh my rent expires tomorrow I gotta get on and get paid and go pay rent', so I'd get on just to do that, and people would start trying to roleplay and I didn't want to at that time, and it was just awkward. So yeah. I dunno. I'll probably get back to it someday, maybe donate to get rid of the rent, and maybe try a different character (I also played a socialite, which I kind of remembered at some point, I hate that kind of RP) and I imagine I'll enjoy it more. But everything else? Nothing but great things to say about the staff and players and most mechanics. Sindome doesn't deserve half the flak it gets. Ancient Anguish (anguish.org) is exactly this. You can play the Rogue class, and one of their abilities is 'steal' which you can use on other players, or NPCs. Theft is "illegal" in the game, so there are consequences if you get caught. Depending on how high your ability is compared to your target's intelligence plus some RNG (random number generator) roll, you can be successful and sneak away with your prize, or fail to steal the item but in a discreet manner, or you fail and get caught. If you are "caught" stealing, the target has the right to do one of two things: 1) Attack you and attempt to kill you, 2) File a theft report and you'll be "bountied" which puts out a reward for your scalp, allowing any player to hunt you down and kill you for the reward. The thrill of that chase is where many of our Rogues get their kicks. Because although you might get attacked upon failing or if you're running a bounty, it doesn't mean you can't fight back and even kill your attackers. The only places where theft is off limits is a few areas like the main starting town, and there's some level limitations to protect low level players from being mercilessly stolen from all day by high level players. Yeah, the crafting time also makes sense. I've only really tried one MUD with permadeath (I think time moved faster there too). I died early, yeah! I usually create one character and stick to it until I get burnt out and leave the MUD (usually around 6 to 12 months in), and the next time I start playing again years later I tend to start a new character. I think I miss a bunch of opportunities by doing that. This one MUD I played for a year only allowed you to hold one item in each hand. It was inconvenient, but it it helped me immerse myself in the game. As am I. Sounds a bit Douglas-Adams-y. I’ve been working on a new test server to help drive the web client. It’s called Spigot and you can find it’s source on GitHub. A telnet test server for Grapevine's web client. Contribute to oestrich/spigot development by creating an account on GitHub. The first thing I’ve worked on adding for this is an IAC flow for using “OAuth” through a TLS encrypted session. I still need more docs around this, but if the server supports it (like Spigot) you’ll get an authorization window for whatever scopes are requested, then you’re just signed in. Next time you load the page as long as there are no new scopes you’ll just be signed in like magic. Once this gets touched up I’m going to start adding in new stuff to the web client. 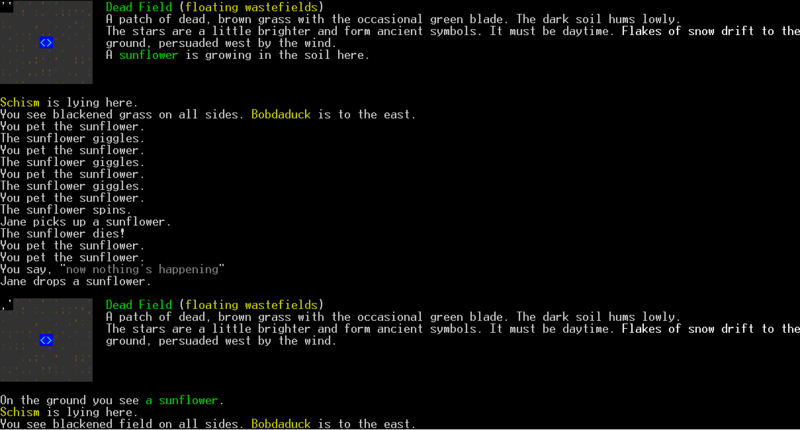 Things like opening modals for help or wizards, sounds and music, and text to speech. It’s an exciting time for the web client! I started playing back in '93 or '94 with legends such as XYD, Zouve, and Meclin when it was called Sojourn and eventually had to quit playing due to life. When I went back years later it was nowhere to be found. I was looking to automate some switch configuration via SSH and ran across cMUD. I grabbed a copy to test and decided to search for Toril while I had it open. Holy cow - it's back! It doesn't have the player counts it once did but it's a huge hit of nostalgia and still worth playing. Yeah, Decker's do not have a ton of coded support behind them. We have been slowly adding more things that are decker specific but there is a long long way to go. I've been working some exciting new features for Grapevine's web client over the last few days. If your game supports a TLS connection and follows a new set of IACs then you can have a player be signed in automatically with only a single "Do you authorize this?" prompt similar to normal OAuth. I am pretty stoked for this as I've wanted to get the web client to a point where you could just load the page and be playing. This is still fairly early on and I need to make better docs, but if you're interested in maybe adding this to your game let me know and you can help shape what this looks like. I like conan the barbarian, evil alignments, horror, occultism, traditional fantasy, sci fi (but seldom the weird mixes). I'm also a novice to mudding, have dabbled in MANY in the past, but always got lost in the multitude of commands and having to read. Now that I'm older I'd like to take on a MUD. My first pick right now is Threshold. I recently added Kavir's protocol handler to my MUD (based on SocketMUD) and for some odd reason ALL other clients work perfectly fine...except for BlowTorch(Android MUD client). I can't figure out why but when you try to input anything into the mud from Blowtorch..Blowtorch ****s itself...freezes and eventually crashes and the phone must be rebooted or force close blowtorch. What am I doing wrong? Help PLEASE! lol. Edit: Specifically it seems to be an issue with the way im calling read() I think.. I've played a fair number of IRE MUDs in the past, and one thing I really liked was the 'explorer' rankings, and being able to tell that you've been everywhere. I like checking those boxes off. Are there any similar MUDs that reward this kind of exploration? The main negative for the IRE games was that being a part of a faction meant that an entire city and its environs were closed off from you, requiring you to jump a few factions just to get those few rooms. Same with rooms locked behind city leadership that still somehow counted toward exploration. The Second Annual Enter the (Multi-User) Dungeon GameJam has begun! Heya! Recently I upgraded my phone from an iPhone 6 to an XR and found that the usual client I'd been using for MUSHs and MUDs, MUDrammer, hasn't been optimized for the X variant and hasn't been updated in 3 years. I was curious if there was any other clients, or solutions to this, available to use. Whether it's made available through sideloading an IPA or compiling a github repo into an IPA. When Ready Player One got its bestselling hype in 2012-13 somebody made OasisMUD. It lasted a while until 2015 when it got shut down. I was wondering what it would take for me to bring it back on my own (Since I’ve never played it) and more races, classes, and a whole lot of new content. I’ve even got a list of 52 possible playable races (still counting) and 21 (and still counting) classes. So I am new to MUDs but my friend told me to try out dragon realms and I have been having a blast. I am looking for MUDs with great combat. I just want to learn a lot about MUDs. When you tell me about a MUD please give me examples of the combat. Like for dragon realms for physical combat it revolves around proper distance control, balance, and position. You can also analyze an enemy to discern a potential weakness in their fighting. This will give you a random combo to execute and doing so will open up the weakness in defense or stun them. For magic, it is a multi step process. You can also target enemies with spells while attacking and moving around the battlefield while they charge up. I’m a curious if it’s possible to create a small MUD that runs off a home server for me and my friends? The itch I’m trying to scratch is a way for us to all roleplay like we used to at the table except we’re scattered across the US.